In order to live an awakened life, we need some wisdom to live by. It is the World Spirituality Dharma of Unique Self and Evolutionary Love that provides us with the Integral Wisdom to guide us every day. Our post-postmodern Dharma is not Dogma, but the best take on reality we have based on pre-modern, modern, and postmodern insights, weaving together what we know about the patterns that connect. Enjoy this collection of 7 Dharma Quotes Graphics for Living an Awakened Life by Dr. Marc Gafni. Apply these pearls of wisdom in your everyday life and become unstoppable in living and expressing the Outrageous Love at the core of your most gorgeous Unique Self. 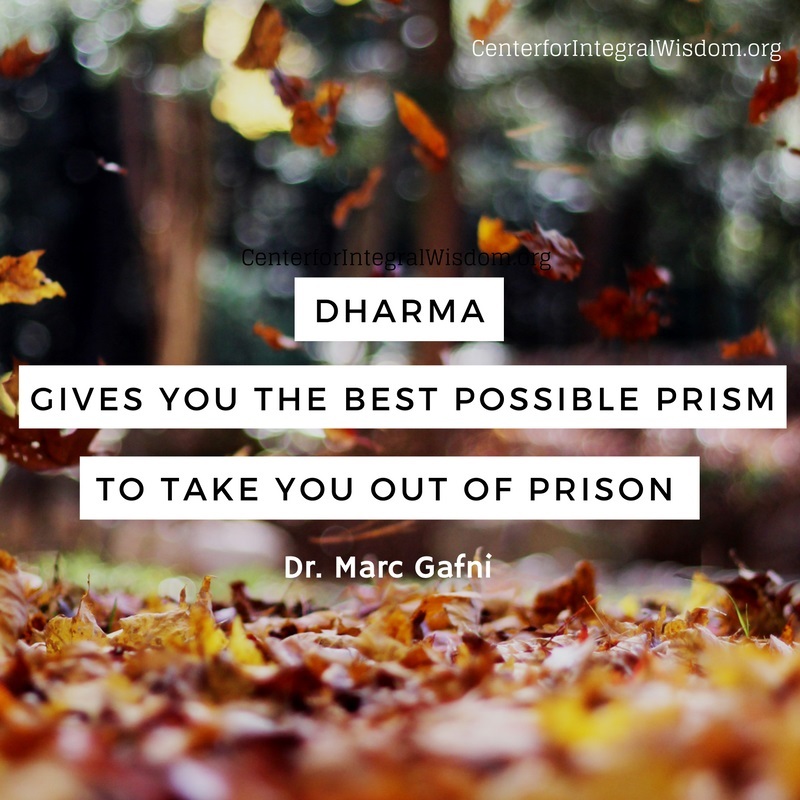 Dharma gives you the best possible prism to take you out of prison. 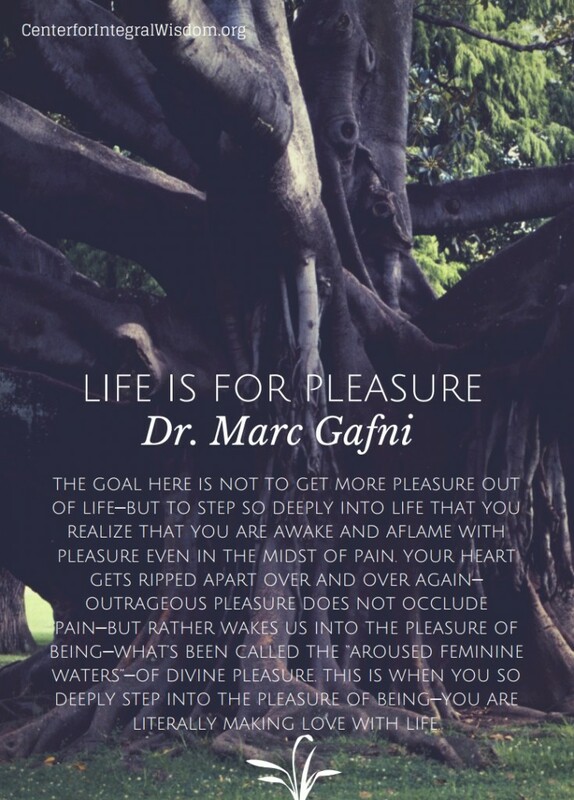 The goal here is not to get more pleasure OUT of life—but to step so deeply INTO life that you realize that you are awake and aflame with pleasure even in the midst of pain. Your heart gets ripped apart over and over again—outrageous pleasure does not occlude pain—but rather wakes us into the pleasure of being—what’s been called the “aroused feminine waters”—of divine pleasure. This is when you so deeply step into the pleasure of being—you are literally making love with life. 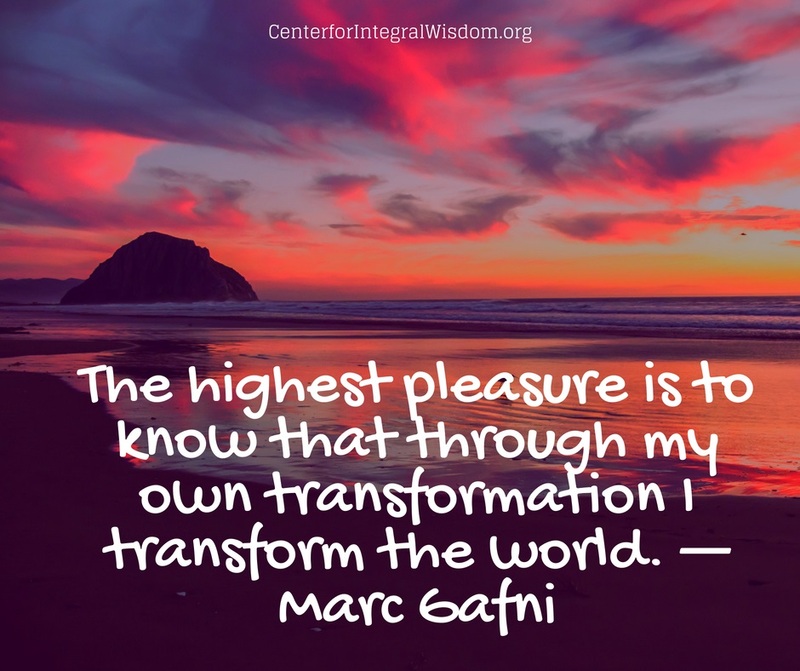 The highest pleasure is to know that through my own transformation I transform the world. 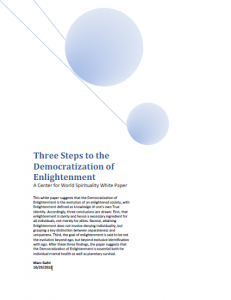 This white paper, "Three Steps to the Democratization of Enlightenment," by Marc Gafni suggests that the Democratization of Enlightenment is the evolution of an enlightened society, with Enlightenment defined as knowledge of one's own True Identity. Accordingly, three conclusions are drawn: First, that enlightenment is sanity and hence a necessary ingredient for all individuals, not merely for elites. 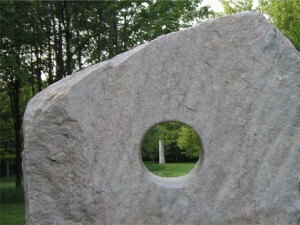 Second, attaining Enlightenment does not involve denying individuality, but grasping a key distinction between separateness and uniqueness. Third, the goal of enlightenment is said to be not the evolution beyond ego, but beyond exclusive identification with ego. After these three findings, the Marc Gafi suggests that the Democratization of Enlightenment is essential both for individual mental health as well as planetary survival. The following are notes from Marc Gafni's dharma talk given in March 2012 at Shalom Mountain Wisdom School, where Gafni serves as the World Spirituality Teacher in Residence. The seven levels of certainty and uncertainty tells the story of how the great religious traditions came into being and how they were challenged first by science, and then by modern and post-modern mindsets. This is a rough sketch of a map of certainty and uncertainty. We have forgotten what we know. Indeed we do not know whether we know or not at all. We do not know whether we know or what we know or even how to know. The general impression today is that anyone who claims to know something is lost in dogma or regressive fundamentalism. Indeed almost the definition of a fundamentalist is someone who claims to know something with is totally “true” about Ultimate issues. A person cannot survive and certainly cannot thrive without knowing. A generation cannot survive without its knowing. 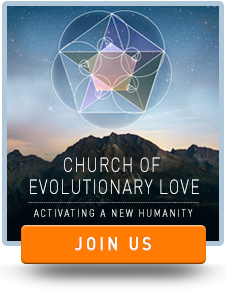 A generation certainly cannot participate in the evolution of consciousness, which is the evolution of love, without knowing what it knows.